I am quite new to QGIS and working with the external applications such as GRASS. When I am using GRASS from the Plugins menu it works. I have GRASS 6.4 installed to my system and running, GRASS 7 installed, but it doesn't run, probably due to some known El Capitan issue. Anyhow, GRASS 6.4 should be working. Moreover, there is also the GRASS that comes with the QGIS installation. Unfortunately I messed up the path to GRASS that was originally set in Processing -> Options before I even tried if the original setup works. I tried really every possible path I could think of, to the GRASS-6.4 installation in my applications folder (/Applications/GRASS-6.4.app) and to the GRASS folder in the QGIS installation (/Applications/QGIS.app/Contents/MacOS/grass), I don't get the GRASS tools to working. I reinstalled QGIS to restore the original settings, but obviously I have to delete the particular settings before (but where? ), because the path was still as I set it before reinstallation. SAGA is working from the processing toolbox. Any suggestions what could be the issue? 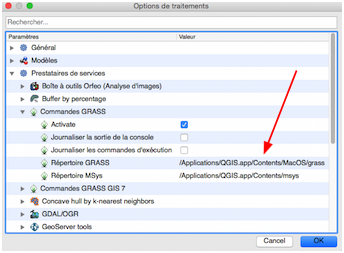 Anyone experiences with running GRASS via processing toolbox with QGIS 2.8 on El Capitan? It would be already a great help if someone could give me the original path to GRASS set at "Processing" --> "Options"
Why not upgrading your QGIS version? To know the GRASS path, you need to know how Processing really works. First, it is a Python module (processing) that uses subprocess to execute the original GRASS commands. Consequently, the script need to know the Grass installation path. With Python in the console, you can obtain the default path (I suppose you use the Kyng Chaos version). Therefore, by default, processing uses the GRASS version installed into the QGIS application with the script grass.sh to launch GRASS and execute commands. You can let the Processing Options (path to GRASS) empty. QGIS always find the path. If you want to use another GRASS version (GRASS-6.4.6.app for example), simply change the parameters in the Processing Options with a folder path that contains the grass.sh script (/Applications/GRASS-6.4.6.app/Contents/MacOS for example). WARNING: current GRASS binaries may not work with EL CAPITAN - OS X 10.11 unless you disable "System Integrity Protection". Not the answer you're looking for? Browse other questions tagged grass mac toolbox grass-7.0 grass-6.4 or ask your own question. “Missing dependency. This algorithm cannot be run” with QGIS + GRASS in Windows 7? Finding GRASS module after upgrading QGIS (Mac)? Adding 3rd party grass script into qgis processing toolbox on Mac?